The Catalina Eddy sets in, and lust, greed, racism, and corruption come ashore. Like the Santa Ana wind, the Catalina Eddy can affect behavior and attitude. The “June gloom” it brings is the background of these three linked novellas. The first begins with a bang: the first thermonuclear test in 1954. 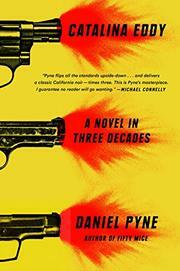 It then follows PI Rylan Lovely (ex–OSS and –CIA operative) through 1950s Los Angeles as he unravels the mystery of his estranged wife’s death. Framed initially in somewhat radioactive prose (“The quiet is harshed by crickets”), the tale settles in and elements of racism, corruption, government secrecy, and misogyny are incorporated. This novella and the subsequent ones, which are set in San Diego in 1987 and 2016, are loosely linked: a child from the first appears as Assistant U.S. Attorney Gil Kirby in the second, and the daughter of Kirby’s FBI partner becomes a falsely accused murderer in the third. The children are believable characters, but their reappearance as adults seems more coincidental than inevitable. Kirby is pressured by the new DA, a Reagan appointee, to dig up dirt on San Diego’s popular, progressive mayor; cartels are involved and Mexicans demeaned; the regular, if not the proper, course of justice is perverted. In the third novella, Finn Miller, a crime-scene photographer, becomes entangled both professionally and personally with undercover police officer Riley McCluggage and her efforts to exonerate a stoic Marine, Willa Ko, who is accused of shooting her husband. All three stories sustain noir conventions: smart, smart-aleck male main characters; women menaced by corrupt and powerful men; daunting weather; a staccato prose style; and an existential attitude. The stories end, mostly, happily (at least for the survivors), and ultimately hope is affirmed despite depressing meteorological conditions. Overall, three engaging and satisfying adventures. A worthy addition to the shelf, between “noir” and now.